BETTER PRODUCTION MMS OCTOBER 2018 108 mmsonline.com HOLE TAPPING The Little Shop That Could (with the Help of a Tapping Arm) Sometimes shops are asked to take on jobs that seem impossible. Little Enterprises, a small shop in Purcellville, Virginia, was faced with such a task last December. A new customer had a job consisting of six plates that each required 600 holes to be tapped. The real challenge, however, was the timeline: The job needed to be completed in a week. 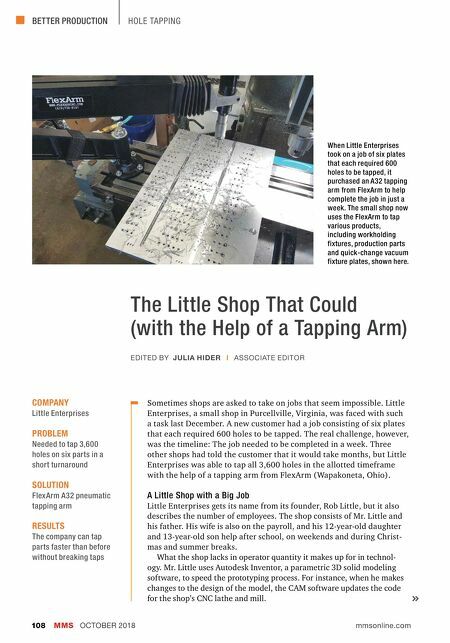 Three other shops had told the customer that it would take months, but Little Enterprises was able to tap all 3,600 holes in the allotted timeframe with the help of a tapping arm from FlexArm (Wapakoneta, Ohio). A Little Shop with a Big Job Little Enterprises gets its name from its founder, Rob Little, but it also describes the number of employees. The shop consists of Mr. Little and his father. His wife is also on the payroll, and his 12-year-old daughter and 13-year-old son help after school, on weekends and during Christ- mas and summer breaks. What the shop lacks in operator quantity it makes up for in technol- ogy. Mr. Little uses Autodesk Inventor, a parametric 3D solid modeling software, to speed the prototyping process. 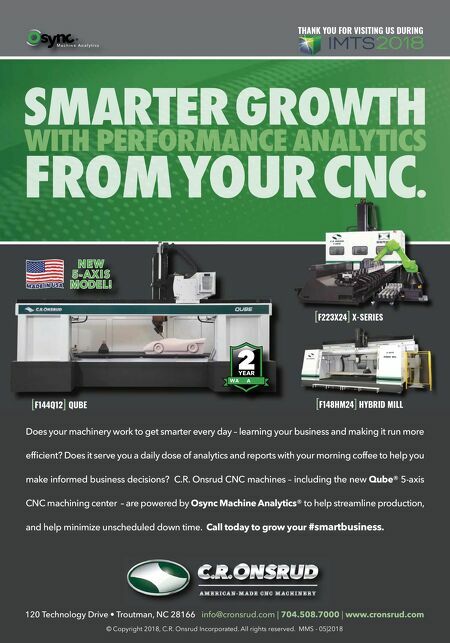 For instance, when he makes changes to the design of the model, the CAM software updates the code for the shop's CNC lathe and mill. COMPANY Little Enterprises PROBLEM Needed to tap 3,600 holes on six parts in a short turnaround SOLUTION Flex Arm A32 pneumatic tapping arm RESULTS The company can tap parts faster than before without breaking taps EDITED BY JULIA HIDER | ASSOCIATE EDITOR When Little Enterprises took on a job of six plates that each required 600 holes to be tapped, it purchased an A32 tapping arm from FlexArm to help complete the job in just a week. The small shop now uses the FlexArm to tap various products, including workholding fixtures, production parts and quick-change vacuum fixture plates, shown here.